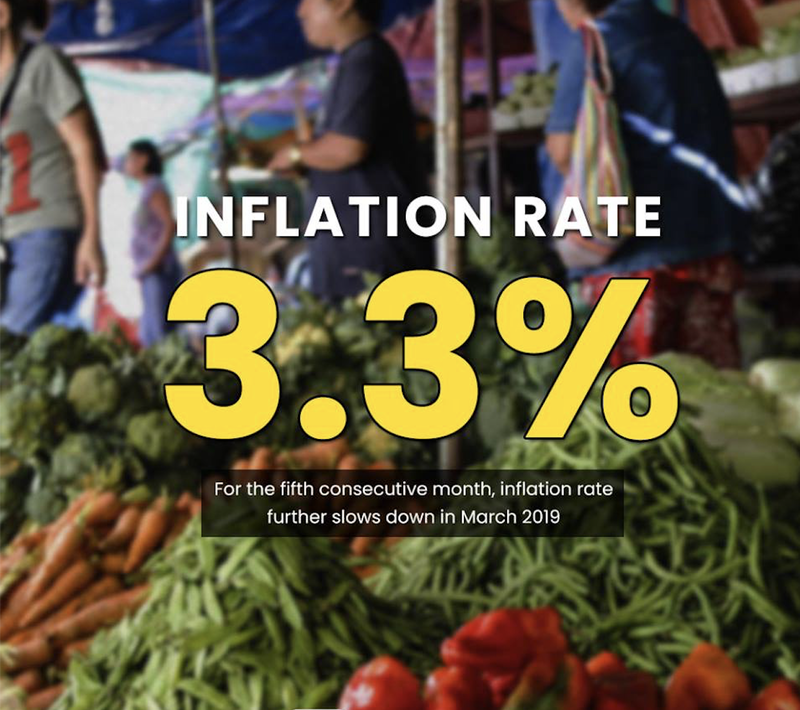 The rate of increase in consumer prices slowed for the fifth straight month in March on the back of declining costs of food items, data from the Philippine Statistics Authority (PSA) showed. Based on the PSA report released Friday, the country’s headline inflation settled at 3.3 percent last month, slower than the previous month’s 3.8 percent and 4.3 percent in the same period in 2018. Likewise, the actual inflation rate is within the Bangko Sentral ng Pilipinas’ (BSP) forecast of 2.0 percent to 4.0 percent. The March level is also the lowest inflation since January last year, the PSA noted. “The downtrend was primarily due to slower annual increase in the index of the heavily-weighted food and non-alcoholic beverages at 3.4 percent,” PSA said. In the first-quarter of the year, inflation averaged at 3.8 percent. Nicholas Mapa, ING Bank senior economist, said inflation continued to slide with the basket-heavy food subsector weighing on the headline number as supply conditions normalize. “With supply chains normalizing, the 2018 inflation pop has faded very quickly with inflation now firmly within target to help solidify expectations for within-target inflation for this year and next,” Mapa said. “With inflation continuing to print within target and with BSP forecasts showing inflation will likely settle right at the 3.0 percent for both 2019 and 2020, we continue to believe that the door to ease monetary policy remains wide open,” he added. Meanwhile, he noted that risks to the inflation outlook remain, including the threat of oil price spikes and El Niño crop damage.